The number of Russian regions declaring drought-linked states of emergency crept upward Thursday, making the official forecast for the size of this year's harvests appear increasingly optimistic. The Altai republic became the country's 17th region to announce that emergency regimes were in place in some of its administrative districts because of scorching heat, following the Orenburg region the day before. The temperature in the Altai republic, which borders Kazakhstan, has not dropped below 30 degrees Celsius this month, said Governor Alexander Karlin, Itar-Tass reported. Last year, the region was the fifth-largest grain producer in the country. Increasing international attention has been focused on Russia's grain harvest as one of the worst droughts in living memory ravages the United States' Midwest, pushing corn prices to record levels and raising the specter of a global food crisis. 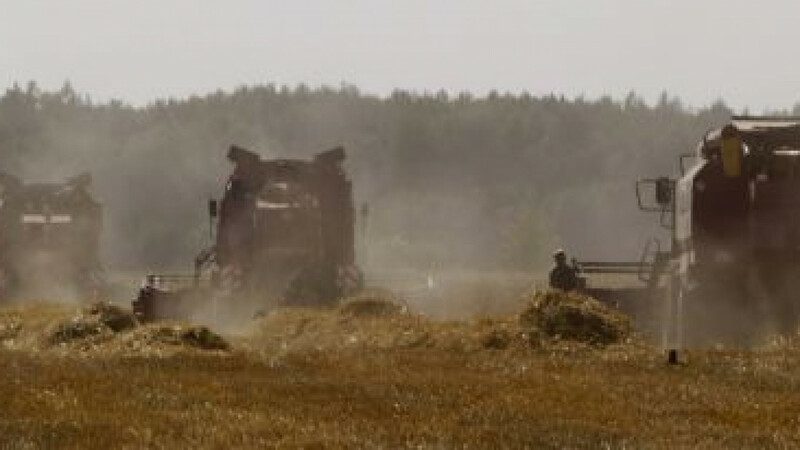 The Russian Agricultural Ministry downgraded its official forecast for this year's grain harvest last week to a range of 80 million to 85 million tons, 10 to 15 percent lower than what was gathered in the bumper crop of 2011. Many are predicting that it could go even lower. SovEcon managing director Andrei Sizov said Thursday that his agricultural consulting company may soon cut its forecast for this year to below 80 million tons, Bloomberg reported. Krasnodar was the first Russian region to complete its grain harvest. Only 5 million tons of grain was collected, compared with 9 million tons in 2011, according to a statement posted Wednesday on the Agriculture Ministry's website. Current harvest yields across the country are 30 percent lower than in the same time last year, said Vladimir Osakovsky, chief economist at Bank of America Merrill Lynch in Moscow. Experts point out that the government was slow to revise its forecasts two years ago, when the country was gripped by the worst drought in more than a decade. In 2010, the Agricultural Ministry cut its original prediction for the harvest of 85 million tons to between 70 million and 75 million tons on August 3. And two days later, Prime Minister Vladimir Putin announced the extraordinary measures of a ban on grain exports and the provision of 35 billion rubles ($1.2 billion) in aid for affected farmers. An export ban becomes increasingly likely if the harvest prediction falls nearer to 72 million tons, Russia's annual domestic grain consumption. Between 1990 and 2011, the average harvest was 81.7 million tons, according to Renaissance Capital. The Agriculture Ministry has said that there are no plans to ban exports this year, and it maintains that 16 million tons of grain will be sold abroad. Russia, Kazakhstan and Ukraine account for about a quarter of global cereal exports. Osakovsky said an export ban is likely because the government is obliged to protect the domestic market from the threat of sharp price increases. "Food price inflation is already on the rise," he added. The scorching weather, which has also triggered huge forest fires, is not restricted to Russia's southern and Volga regions but is also seriously affecting the southern parts of the Urals and Western Siberia, where harvests are completed later in the year. With the drought already wreaking damage, some people have resorted to seeking divine intervention. Officials collaborated with the Orthodox Church in the Kemerovo region, which borders the northern edge of the Altai region, to hold prayer vigils Wednesday in an effort to induce rain. A similar prayer vigil was held in Omsk on Sunday.